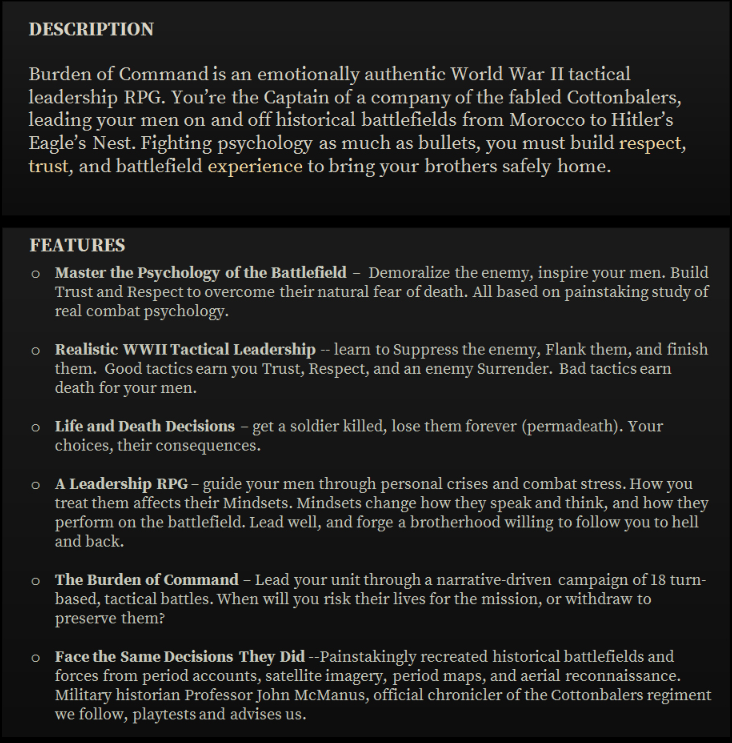 An indie single player turn-based WW2 Leadership RPG with some tactical actions in the mix, sounds good? There's more : it's designed as a respectful homage to the Golden Generation, with "Band of Brothers as a guide to that tone", with a focus on the Cottonbalers for a start. It is pushed forward by what seems to be a talent laden team, like @Stoffel and @Mad Russian to pick two who we might know well here. Ooops! Just have been told that links to other companies might be frowned upon. I did mean no harm, sorry. Could a mod please delete the offending material? Shame... the game looks like one of the cookie cutter simplistic 2D games from Matrix - but glossied up with actual WW2 footage to make it more marketable. Hard to tell if it's better or worse than Close Combat series. I have been following this game for some time now, the game is more an RPG than a Strategy game, each event presents you with decisions you have to take. For example a mortar kills one of your officers, you wait for a medic, leave him there and advance towards the objective or retreat taking him? Each option has its consequences, etc. Although graphically it might be similar to other games, gameplay wise it's nothing like Close Combat or Matrix Games. Sadly, the developers are working at a slower pace than I thought they would. Ok, that does sound more interesting. I guess we have to wait for a demo. Yeah, look around 1:17 in the video above for example. You can choose to bolster your men assaulting an eny MG position by leading the assault with your Lt at the very risk of loosing him, you could retreat, and so forth. Choices are said to have a long term effect, etc. I see it as 2020 version audiovisual version of a You Are the Hero book. This method of roleplaying could be fun. It's a bit like Squad Leader maybe? Matrix has an operational game that was enjoyable for a while called "Decisive Campaigns: Barbarossa" in which the player had to make many political (with High Command personalities and Hitler) as well as operational decisions which would affect the efficiency of one's units. But, it soon felt like a gimmick and got boring.